Intent: To submit a new base of operations for the Republic Strategic Information Service on Carida. Population: Overwhelmingly analysts and other non-combat personnel, but there are several concentrations of elite special agents with ready access to military hardware in designated secure areas. Accessibility: Taking the hide in plain sight approach, officially Ressl Towers are nothing more than a cluster of civilian owned cloudscrapers in the heart of Republic City's National Square. Anyone in the city can walk inside off the street, its gaining entrance to the operations center underneath that presents the real challenge. Description: The Ressl Towers are an interconnected series of corporate high rises in the very heart of Republic City on Carida. Filled with floor after floor of office space and data terminals, to the casual observer the facility is designed to resemble a picturesque facet of the city's skyline. Underneath this nondescript corporate enterprise lies Republic Intelligence's strategic epicenter, central operational command for the entire Carida system and, by extension oversight for all assets across New Republic space. The Carida Operations Center is a subterranean bunker complex designed to withstand everything up to and including large scale baradium fallout. An extravagant, surface level facade constructed to obfuscate the comings and goings of intelligence personnel, the Ressl buildings are far more than a simple tradecraft facsimile. Vast office space is utilized for low level analysis work, and there are several amenities available for those stationed or just visiting the facilities below. Complete with an in house tailor and refined cantina, no expense has been spared by the SIS to conceal themselves in luxury. A direct access turbolift leads from central operations up to Ressl's rooftop level, where unmarked airspeeders and shuttlecraft land and depart in droves every day. Situated in the heart of Republic City's urban center, nearby traffic lanes are so congested that its practically impossible to remotely track inbound and outbound transports much to the benefit of the SIS. Accessible only via a camouflaged, biometrics activated service lift, the main Operations Center lies at the heart of a subsurface bunker several hundred meters below Ressl Towers' ground level. Aside from the occasional high level strategic council, this is where much of the day to day oversight for ongoing Strategic Information Service operations occurs. 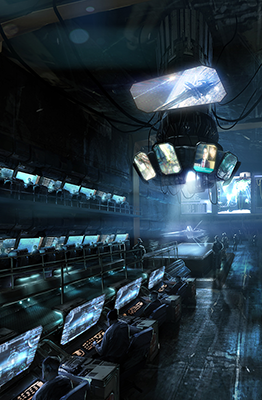 The Operations Center looks not unlike the command deck of a capital ship, scattered data terminals and holodisplay projections all surrounding a central command dais. Always fully staffed around the clock, plainclothes agents work right alongside those in Republic military fatigues or combat armor. More than a simple firearm repository, some of the most cutting edge tech in all of New Republic space is available here for testing and practical application. Supplied by shell companies based on Arkania, the Service's top agents are given access to a variety of high tech utility packages depending on a given mission profile. Three whole floors of beyond next generation data servers, Network Access contains some of the most sensitive information in all of the Republic. Due to its critical nature, these terminals exist in a self-contained environment, with robust anti-tampering security measures. Extraordinarily accurate sensors, temperature regulators, even pressure gauges are designed to trigger emergency alarms at the slightest change of internal readings. In close proximity to Network Access is Signal Intelligence, a data security and threat analytic subdivision that employs some of the most talented slicers on the federal government's payroll. SigInt specializes in digital intelligence gathering and counter-espionage, but are also adept at predictive analytics and advanced cryptography. Despite the fact that no one can even verify the Director's identity, he or she maintains an office below Ressl Towers that is guarded around the clock. No one has ever been seen inside, yet all transmissions with the head of Republic Intelligence are routed through this room, and somehow datawork that is delivered to the office presumably reaches the Director's hands. It is a very nondescript room, spartan and un-decorated, save for a Republic starbird inscribed on the wall behind a solitary desk. The Ressl Towers structure itself features predominantly LOW level security. Posting considerably better trained personnel than the average contractor, these guards are capable of handily resolving any mundane concerns but aren't meant to stand up against something like a tactical strike or all out planetary invasion. However, below the surface is a HIGH security bunker filled with trained assassins who have access to heavy weaponry. That said, due to a reliance on secrecy and the sheer level of security clearance required to be posted here, the operations center is more lightly guarded than some Republic military facilities. There is not enough room for armor or artillery, and its security systems are prone to sabotage if a double agent can gain access. Publicly owned by a rotating list of shell companies and dummy conglomerates, the Ressl Towers complex has been a part of the Republic City skyline practically since the capital's colonization. A series of interconnected cloudscrapers situated at the heart of National Square, ostensibly large swathes of floor space are for lease as part of an economic development program. Anyone with enough connections within the intelligence community knows that it is all one giant facade. Utilizing their considerable Core World assets, the Republic Strategic Information Service which at the time still consisted primarily of Alliance expatriates established the Ressl buildings and a highly secure military bunker below it for use as their base of operations on the new capital world. It is something of an open secret by now that Ressl plays some role in the New Republic's intelligence apparatus, but the true extent of its nature as the heart of all SIS operations on Carida and beyond is a closely guarded secret. The subterranean Carida Operations Center is a sprawling underground labyrinth. Still struggling to recover from recent intergalactic events, SIS command like the organization itself is constantly in flux. Its mandate is a broad one, responsible for counter-intelligence, foreign intelligence, military intelligence, and consultation with local law enforcement. I like seeing these low-scale military bases. Nice addition to the New Republic's lore.